Punch Needle embroidery is fast, easy to learn, and fun! With punch needle, you can create textile objects like pillows, rugs, wall-hangings, and so much more. One of the great things about punch needle embroidery is that it’s so easy to learn. You can learn the basic technique in an afternoon. And, you only need a few punch needle supplies to get started! If you like the look of traditional embroidery or rug hooking, you will love punch needle embroidery. Punch needle is a great craft for both beginners and experienced fiber artists. It’s easy to pick up the basic techniques in just a few hours of practice. Another great thing about punch needle embroidery is that it only requires a few supplies. You won’t need to much extra storage space for your punch needle projects. I’ll go into more detail about my recommended supplies below. But if you are looking to get set up quickly, take a look at one of these recommended punch needle kits. Punch needle embroidery is the craft technique of using a punch needle tool to loop yarn, floss or ribbon through monk’s cloth or burlap fabric to create a pattern or design. For even more detail, check out this post all about punch needle supplies. To start, first thread the yarn through the eye of the needle tool, and up through a slot in the handle. Then, holding the punch needle tool like a pencil, use the tool to punch through the holes in the monk’s cloth fabric. With each stitch, the tool forms a loop of yarn on the back side of the fabric. The loops are held in place with the tension of the woven backing fabric. Traditionally, punch needle projects are worked from the back side, or “wrong”, side of the fabric. For this reason, punch needle patterns are printed in the reverse. The back side of a finished punch needle project looks more like embroidery, while the front side (or right side) has loops like a hooked rug. Although the looped side is traditionally called the “right” side, some artists prefer to display the back side of their work as the “right” side — it’s a matter of preference! 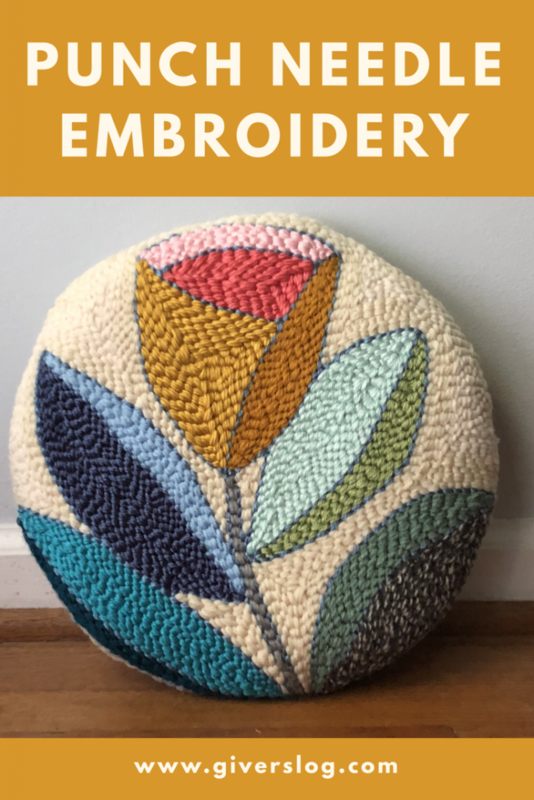 If you are looking to try punch needle embroidery for the first time, you’ll need to gather some new tools and materials — namely the punch tool, yarn, fabric, and a frame to hold it. A punch needle is a very simple tool. It consists of a hollow, metal needle with an eye through which to thread the yarn, and a channel to guide the yarn. When shopping, choose a punch needle tool that is comfortable to use and easy to control. Punch needle tools come in different sizes to accommodate different weights and types of fibers. There are two main types of punch needle tools that you’ll find online: a small size to use with embroidery floss, and a larger size to use with rug yarn. Smaller punch tools, like the Ultra Punch, are used with 6-strand embroidery thread on fabric with a tighter weave — like linen or weavers cloth. Larger punch needle tools, like the Amy Oxford punch needle, are used with bulky wool yarns on specialty backing fabrics with a looser weave — like monk’s cloth, primitive linen, burlap, or rug warp. The next item you’ll need for punch needle embroidery is yarn. If you are using a regular width punch needle, like the Amy Oxford #10 regular width needle, you’ll want to use heavy 3-ply rug yarn or bulky weight knitting yarn. You can also use thinner yarn if you double or triple them up before threading them through the punch needle tool. For instance, I’ve used doubled worsted weight yarn, and tripled sock yarn. For punch needle embroidery, you’ll need to use a woven, non-stretchy fabric for your backing fabric. Depending on the size of your punch needle tool and yarn, you can choose between several types of fabric. With the smaller punch tools + embroidery floss, choose a tightly woven fabric like Weaver’s Cloth. Weaver’s Cloth is a poly-cotton blend, so it’s simultaneously stronger and less stretchy than pure cotton. And, the heavier weight of the Weaver’s Cloth fabric holds the punched loop securely. You can find Weaver’s Cloth online, and in the bottom-weight section of craft stores like Joann. With the larger punch needle tools + bulky yarns, choose fabrics with a looser weave — like monk’s cloth, primitive linen, burlap, or rug warp. My favorite foundation fabric for punch needle is Monk’s Cloth. Monk’s cloth is made of 100% cotton and is sturdy, yet flexible. It is a good choice of foundation fabric for pillows, bags, stuffed toys, and other items which need a bit of flex. Monk’s cloth is available several sizes of weaves. The size of the weave is measured by how many holes are in one inch. This is called the fabric’s count. The most common counts in Monk’s Cloth are 7-count and 12-count. 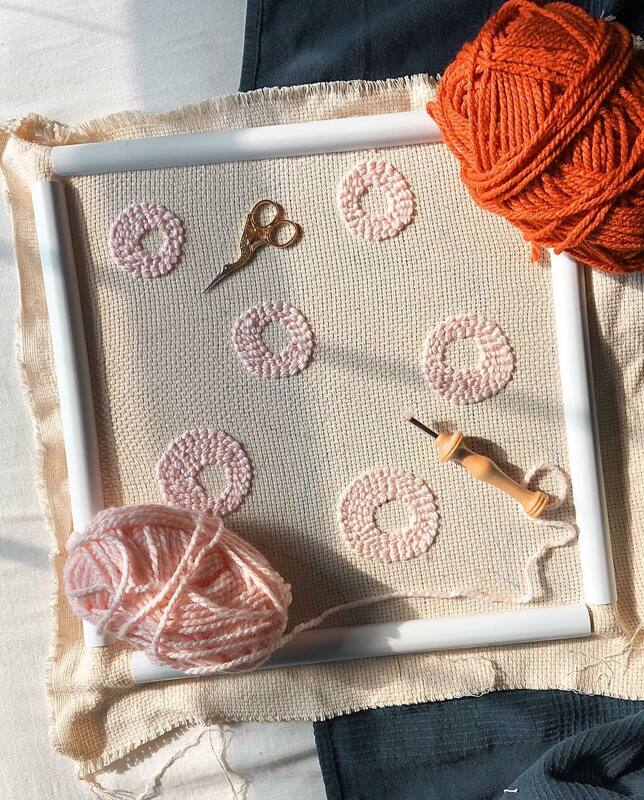 For punch needle, choose a monk’s cloth with approximately 12 holes per inch. Most craft stores carry a type of monk’s cloth with a much larger weave, usually 7-count. This type of monk’s cloth has a very open weave, which means your yarn won’t be held as tightly and may slip out. For punch needle rug hooking, the backing fabric is stretched tightly on a frame or a no-slip embroidery hoop. The frame keeps the backing fabric taut and the grain lines straight while you punch the rug. For punch needle rug hooking, your backing fabric needs to be stretched really tightly! There are a few types of frames that work. To get started with punch needle embroidery, you’ll just need a few supplies. For this project, we will be using the larger size Amy Oxford punch needle and bulky weight wool yarn. For our foundation fabric, we will be using monk’s cloth. Transfer the Design. Use a pencil or a water-erasable marking pen to transfer your design onto the fabric. Trace your pattern onto the “wrong” side of the fabric, remembering that it will be reversed when turned over. Stretch the Fabric. For punch needle embroidery work with wool yarn, monk’s cloth is a recommended foundation fabric. Wooden frames or no-slip embroidery hoops work best for punch needle embroidery. It is important to stretch the fabric tightly in the frame or hoop for best results. Thread the Needle Tool. You can thread the Amy Oxford punch needle by hand — first by threading the yarn through the eye of the needle and then pulling the yarn down into the slot in the handle. Some other punch needle embroidery tools require a threader to help get the yarn loaded. First, pass the threader up through the needle end. Pass the embroidery floss through the metal loop sticking out. Then, pull the threader out of the tool. Next, insert the threader into the front of the eye of the needle. Insert the embroidery floss and pull the threader through. With that done, you’re ready to punch. Start to punch. To start, outline your design with stitches. Insert your needle, leaving a small tail of yarn through the eye of the needle, and the rest of the yarn out through the handle. Pull the tail of thread to the “right” side of the fabric. (Remember, you are punching from the back!) Punch your needle tool straight down, making sure the shaft of your needle has gone all the way down. Gently pull your needle back up. Move the needle along the surface of the fabric a small distance, and punch again. (Don’t pull your needle too far away from the surface of the fabric!) To change directions, turn your needle in the down position. Keep on Punching. As you go, you’ll see a line of flat stitches on the back and small loops on the front. Continue filling in your design by following your transferred design on the fabric. To change colors, rethread your needle with more yarn. Insert the tool as before, leaving a small tail as you did with the very first stitch. You don’t need to tie any knots. The tension of the fabric will keep your stitches in place. Make a Mistake? If you make a mistake or a stitch doesn’t want to stay in, gently pull on the embroidery floss to undo the work. Gently scratch over the fabric to erase any mistake punch holes, and punch the area over again. Finishing. When you’re done punching, simply trim your thread, leaving a small tail on the “right” side of your work. Remember, no knots are needed. 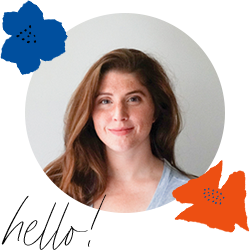 If you are looking for more information about punch needle embroidery, check out my Top 10 Punch Needle Tips, and Punch Needle FAQs: Troubleshooting Problems.